The reason was mainly because it seemed kinda stupid to knit the front and the back separately while working on a circular needle. 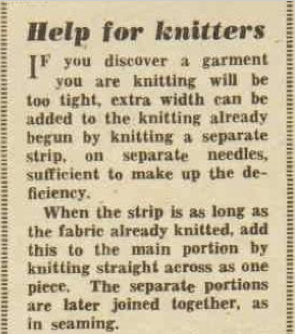 The whole thing could be knitted in one piece up to the armholes with the fastest stockinette ever working knit stitches only, so why not to do that? One reason could be of course, that you want to make a period-correct garment, exactly like the original specifications. I just like working fast at the moment and make things easier for myself, so re-started with casting on all of the stitches both front and back on my needle. Since you can't try on the jumper while knitting you have to wait until you start shaping the armholes. At that point you knit the front and the back separately. I start with the front and transfer the stitches that belong to the back (from stitchmarker to stitchmarker) to a spare needle. You could use a piece of yarn for this purpose too. This is the point to fit your jumper. Check not only the width but also the length! The point where the armhole shaping begins should be about 1 inch (2-3 cm) above the apex. Pin the upper part of the jumper to a shirt to check if you like the length as it is. If you were aiming for a negative or zero ease and happen to find it too tight in the bust area you can still make adjustments. Rip off about 4 inches (10 cm), until well under the bust line and you can increase from that point a little more. I'd say, about 3 inches extra increase in width, divided between front and back is possible and almost invisible. Sometimes, no matter how carefully you calculate the sizing turns out to be not accurate. Often you just have to rip out everything and start over. Well, I do dat quite often if I'm not satisfied with the width after finishing the ribbing. Since I didn't knit a lot, stitch markers weren't featured in my stash. However, stitch markers are essential when knitting a large amount of stitches. I had to catch on more than 200 stitches so I placed a stitch marker after every 20th stitch to make counting easier. After the first row I removed the markers and only left two for marking the sides. When knitting in round you often have over 200 stitches on your needles. It's a good thing to recount from time to time to check if you didn't miss any. To do this use simple, home-made stitchmarkers as below. Safety pins and paperclips are often used as a budget alternative but I didn't like them because they are rigid and have sharp edges so can accidentally hook into the yarn pulling it apart. The ultimate budget proof solution was to use my left-over crochet yarn by making small loops of it. I placed them between the stitches on my needles but you also can place them around a stitch (even literally knit into a pattern) and simply cut away when not needed anymore.